Teachers are the person who are the most respectable person. Teachers who teach you the valuable lesson of life as well as the part of study. Do you know why we celebrates the teacher’s day on 5th September every year? We celebrates the teachers day in honour of Dr Sarvepalli Radhakrishnan, who was born on September 5, 1888. Dr Radhakrishnan was India’s second president and awarded by Bharat Ratna. There’s no better day than Teachers’ Day, to give respect with the inspirational words to the teachers who inspired you and taught you valuable lessons. Teachers’ Day is celebrated in India on 5th September every year. It is the birthday of Dr. Survepalli Radhakrishnan. This great son of India was an outstanding scholar and teacher. Later on he became the Vice President of Indian republic when Dr. Rajendra Prasad was the President of India. When he died, Radhakrishnan became the President. Teachers’ day is observed to pay respect to the teachers of our country. We also pay our respect to our own teachers. Teachers are regarded as the back-bone of our society. They have the greatest contribution to build up the characters of students and help them to become ideal citizens of our country. The teachers teach students most carefully and sincerely and love them as their own children. We owe them more than our parents. Our parents bring us up and give us food and drink for our survival, but teachers arouse our hearts with light of knowledge and remove all sorts of ignorance. The study that we do at schools and colleges build the foundation of our character. The teachers inspire us to proceed forward, to build our ethics and prepare us to withstand obstacles of our life. The teacher also imparts immense knowledge and wisdom in our lives. On this day, teachers are honoured through various functions and these functions are celebrated at every place throughout the country. The government also pays respect to them by giving different awards. On this day, we give them thanks and honour them by saying, – we are grateful to you dear teachers for all you do for us. Teachers work hard day and night to bring out the best in students. They unfolds the our hidden talents and creativity . Just like a good gardener, a teacher sows the seeds of moral-ethics within us so that we can become good citizens. A teacher is a friend, philosopher, and guide who holds our hand, opens our mind, and touches our heart. The contribution of a teacher cannot be ignored at all. In many countries across the world, teacher's day is a special day where teachers of schools, colleges, and universities are honored specially. Many Peoples are Sending the Happy Teachers Day Quotes The date varies from country to country. The universally accepted World Teacher's Day is 5th October. In India, the Teacher's Day is celebrated on 5th September and this tradition started from 1962. This is the when Dr. Sarvepalli Radhakrishnan was born. He was a philosopher, scholar, teacher, and politician and his dedicated work towards education made his birthday an important day in the history of India. We remember the great work of this exemplary person on this day. 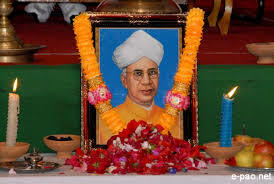 Actually, this man, Dr. Sarvepalli Radhakrishnan was a friendly teacher and he was popular among his students for the example he always set in front of them. So, one day his students and friends requested him to allow them to celebrate his birthday in a lavish way. In return he said that it would be his pride and honor if they celebrate his birthday in respect of all teachers. And since then this day 5th September is celebrated as Teacher's Day. Now, talking about the rest of the world, World Teacher's Day is celebrated on 5th October and it started form 1994. It was UNESCO who started this tradition. The focus set by UNESCO was to celebrate the engrossment and accomplishment of teachers and also the primacies that they put on the field of education. Now why 5th October is taken up as the Teacher's Day? On this day in the year 1966, a special intergovernmental conference adopted the UNESCO endorsement regarding the statuses of teachers. Teaching is the most influential job in the world. Teachers are known to shape the mind of youth and without knowledge no one can exist in this world. Teacher imparts good value in children and turn them into responsible citizens. So, almost every country celebrates Teacher's Day. In India, we celebrate this day on the birthday of Dr. Sarvepalli Radhakrishnan. He was a man of many good qualities and a favorite teacher among students. It was his request that his birthday should be celebrated as an honorable day for all the teachers in the country, in case someone is wishing to celebrate his birthday at all. So, in a nutshell, we celebrate Teacher's Day because teachers have been the architect of the society and without them no society can walk in the path of progression. In his book titled, "Political Thinkers of Modern India", he signified the importance of teachers and education in a country like Democratic India which was still in its early years of development. According to him, there is a huge role of teachers in nation building and for that sake teachers should be respected more. Apart from being a thinker and teacher he was also a philosopher. He once wrote a book on Bhagavad Gita and there he defined a teacher as, “The one who emphasizes on presentation to converge different currents of thoughts to the same end”. By the time he entered politics, most of the leaders of that time like Jawaharlal Nehru, Mahatma Gandhi, or Dr. Rajendra Prasad were his fans for this thinking in nation building. His skills were proven in the arena of politics also. He had the political insight to recognize the impediments well in advance and also carried the required courage to scold party leaders for their procrastination and delinquency. Way back in 1947, he warned the former Congress people about the alarming consequences of nepotism and corruption. We are dealing with it now! Such a man of course requires a standing ovation. So, to promote the values and principles of a true teacher, this day is celebrated.